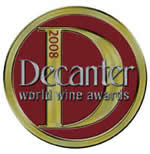 Kanonkop Pinotage 2004 won the Decanter 2008 World Wine Awards 2008 Trophy for 'South African Red Single Varietal Over £10' and Southern Right's 2006 Pinotage won the only Gold medal awarded to Pinotage. 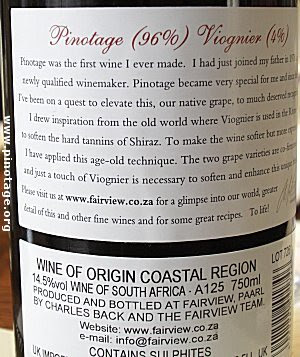 Another 36 Pinotages won awards (9 Silvers, 16 Bronzes, 11 Commendeds). Six Cape Blends won awards, 1 Bronze and 5 Commended. Kanonkop are also celebrating winning the Trophy for 'Red Bordeaux Varietals over £10'. Award details are here. But the picture is not so bright over at the International Wine Challenge where 28 Pinotages gained Bronze and Commended awards, and a solitary Silver was won by Majors Hill 2006. Award details are here. Congratulations to Café Culture – KWV’s coffee accented Pinotage –which has won the award for Best Red Wine in its price category at the Vinnordic Wine Challenge. 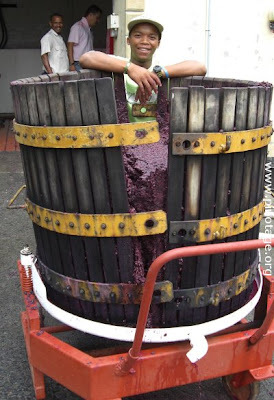 But they’re not changing their winning traditional winemaking methods. As the Clos Malverne labels say, their wines are fermented in open tanks and basket pressed according to methods used in the Cape for over 300 years. And the first thing I saw as I walked towards the winery was an old basket press being emptied of the skins. A trickle of bright, almost fluorescent, purple juice meandered across the floor. Yes, it was Pinotage. They've opened the traditional basket press in order to dig out the compacted skins now that all the juice has been extracted. This is a 50/50 blend of Pinotage and Merlot. It is deep red with a warm nose and rich silky ripe mouth feel. 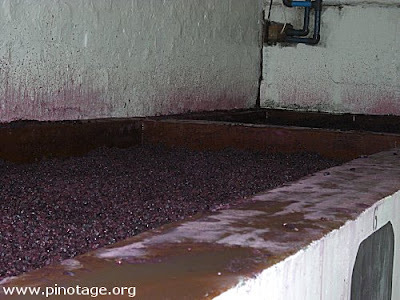 There are some firm tannins and bright acids on the finish which become quite dry and dusty. Seymour says “at 35R this is a low price wine for easy drinking” but it seemed pretty serious to me and would benefit from ageing – and a good steak. is a 2nd label for export and this is a Cabernet Sauvignon/Pinotage blend. “It's very good wine at a very good price,” says Seymour. “It’s sold in Holland, Ireland, and Belgium, biggest brand by volume. The reason it is so successful it that it over delivers quality on price.” This has a lot lighter than the previous wine, with a sweet approach leading to soft gentle berry and redcurrant fruits. Very drinkable. Eleven years old – there’s a little stink on the nose, the wine is fully mature and light bodied with restrained aged berry fruit flavours; a very pleasant wine. “We added 15% Merlot to soften the tannins,” Seymour said. This was a Top 10 winner in 2006 and it was a worthy winner, with a delightful melange of smooth ripe berry fruits, a lick of banana, gently integrated tannins and reviving acids. Cracking good wine. Auret is the flagship wine and takes its name from Seymour’s mother’s maiden name and Seymour’s middle name. This is a Cabernet Sauvignon/Pinotage blend with 15% Merlot. There’s soft ripe fruit on this nicely aged wine; sweet mulberry and blackberry, classily velvety smooth and elegant. It is a real bargain at between 100-125R, “We like to keep our prices competitive, ”Seymour told me. Zaine expects the new tasting room to be ready in mid-2008 so I will definitely be returning to see it on my next visit. 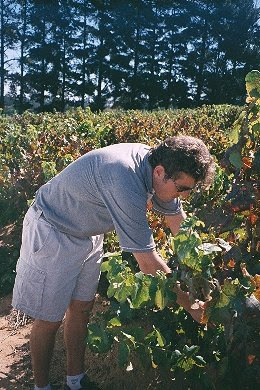 Pinotage is the favourite South Africa wine with California consumers. Nielsen figures show that Golden Kaan’s Pinotage is the top selling South Africa wine in Northern California grocery outlets*. 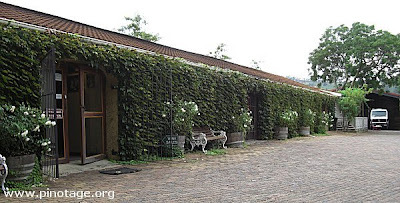 Golden Kaan was formed in 2003 and is a joint venture between Racke International, who market and sell the wine internationally, and South Africa’s KWV International, who produce the wine in Paarl. Other Golden Kaan wines include Pinotage Rosé, Chenin Blanc, Sauvignon Blanc, Shiraz, Cabernet Sauvignon, Merlot and Chardonnay, all retailing around $10. Shortly after arriving in the Cape I received the following email. It may be that you come from the UK, in which case you have been denied theprivilege of tasting the pinotage of your life. This would be M'hudi pinotage and I should be glad to explain to you the reason for this deprivation. The message was signed ‘Oupa’. 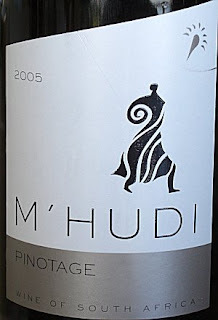 I was intrigued, but the name M’Hudi was not unknown to me as Marks & Spencer in the UK stock a stunning M’Hudi Sauvignon Blanc. It was difficult to arrange a visit to meet Oupa since not only was he in the middle of the harvest, but a TV camera crew was monopolising his time for a documentary programme. Oupa, meaning Grandpa, is the nickname of Diale Rangaka and I finally managed to meet him on his farm. Oupa’s farm is on the same road as the Villiera winery. Villiera’s owner Jeff Grier and his wife called to introduce themselves and to welcome the Rangaka family to the neighbourhood. 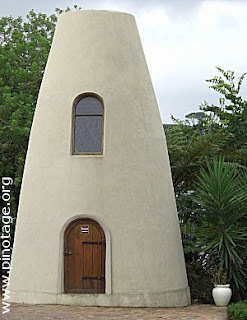 Simon Grier lives next to M’Hudi and passed every day on his way to the winery. 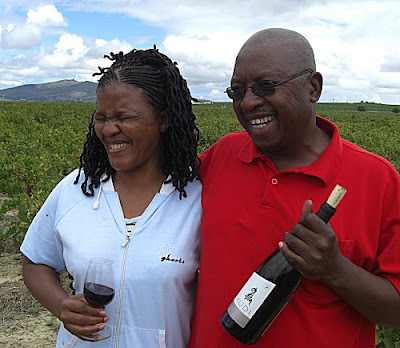 “Simon would stop and ask “Why are you doing that?” laughs Oupa, “and he’d point out what needed to be done.” Oupa’s son Tsêliso went to learn winemaking at Villiera and the first M’Hudi wines were bottled and sold from Villiera’s tasting room. Then Marks and Spencer came calling. 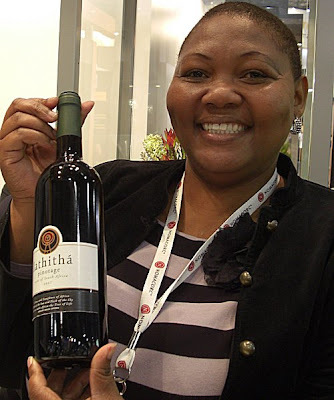 They were interested having exclusive UK rights to M’Hudi wines and Oupa, knowing their reputation, agreed. “M&S helped us set up proper procedures for admin, worker health and safety and they helped us get WIETA accreditation. Since M&S have exclusivity they have kept M’Hudi’s attractive front labels, with just the M&S name overprinted. Inspiration for M'Hudi's name came from Sol T Plaatje’s novel published in 1930, the first to be written in English by a black South African. M'hudi's story is one of courage, determination against seemingly impossible odds and the relentless pursuit of one's dreams and wishes. The label shows M’Hudi – derived from the Setswana word, Mohudi meaning Harvester – scattering seed on the ground while above her flares Halley’s comet. Oupa tells me the name can be pronounced either as M’-Hoodee or Moody. Attractively soft and approachable, with generous plum and vanilla tones and some tannins on the finish. 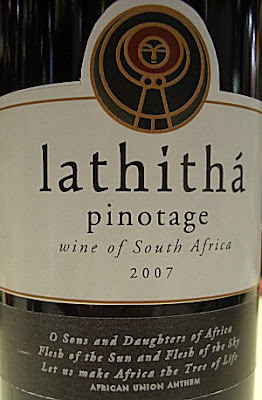 Good drinking, if not the Pinotage of my life, but give them a few years and who knows…. Oupa has great plans for his farm: a restaurant, accommodation, function room and a tasting room are in the future. But for the time being taste the M’Hudi range at Villiera. In the UK, Marks & Spencer stock M’Hudi Merlot and Sauvignon Blanc but not, unfortunately, their Pinotage. *Oupa was most insistent that I used the correct spelling of the place the British know as Mafeking. Mafikeng means 'the place of stones' and Sol T Plaatje worked there as a magistrates' court interpretor and kept a diary during the famous siege. Golden Kaan offers a pinotage, the flagship wine of South Africa, for 10 bucks that also is medium-bodied, an attractive garnet, a very delicate nose of black berries, and dark fruit on the palate. The finish is lengthy. Those who like the lightness but forceful fruit of sangioveses (the grape of Chianti) are likely to find pinotage to their liking with hearty foods. I can see where he's coming from on this, can you? "If the focus of the winery is to delve in Burgundy and Rhone style grapes then I think the ultimate expression of that is to have Pinotage in the flavor mix. This coming spring we’ll release our first Pinotage". 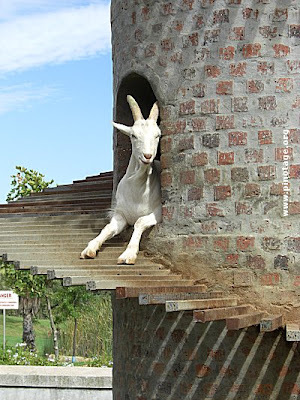 Fairview Winery must be on the ‘must-see’ list of every visitor to the Cape with the international fame of the Goats do Roam family of wines and Fairview Cheeses, and the place keeps expanding to cater for them all. Car parks have replaced vineyards, the small tasting counter is now a grand tasting hall and this year there is a new restaurant bistro offering a full meal service in addition to the cheese tasting counter. Owner Charles Back is one of the Capes most innovative wine producers and I popped in to see what was happening. As wandered into the tasting room a door opened, a young woman stepped out and cried out my name. I don’t know who was more astonished. Anita Streicher and I had last seen each other several years ago when we were working together teaching classes for the Cape Wine Academy in London. I knew she’d returned home to South Africa to work for Makro’s wine department in Johannesburg as I received her informative Makro newsletters. Now here she was at Fairview in charge of the newly opened Beryl Back Room. This is a separate room where visitors can take their time and enjoy a personalised seated, tutored tasting of wines paired with Fairview cheeses, away from the hubbub of the main tasting room. The room named after Charles Back’s late mother and is furnished with a selection of antique and unique furniture collected by the Backs during their travels. I couldn’t leave without experiencing the room, but I had been tasting wine all day so, much to Anita’s disappointment, I asked to taste just the following wines. My partner was tasting her own choices and had become enamoured of a sweet Special Late Harvest Viognier so when Anita told her it was only available at the winery she ordered a case for home delivery. And two weeks later a courier was knocking at our door with a sweet reminder of our visit. When you next visit Fairview it is well worth upgrading to the comfort of the seated tasting in the Beryl Back room. And do please give my regards to Anita.